I probably spend far too much time on a daily basis considering the forces of universe. Honestly, I can sit for hours, cup of tea in hand, and stare into the distance, thinking about what it means to be a tiny molecule in this vast expanse that is reality. Unfortunately, the powers-that-be have told me that this is an unacceptable use of company time, and have threatened to take away my volcanic lair and replace it with what I’m assured is a very comfortable half-cubicle, unless I actually get to work. Really, they have no appreciation of the finer things in life. If work I must, then work I shall: and you will reap the benefit. For this week’s delightful Gadgetbox repast, we bring you the latest in deadly foam darts, more on Nintendo’s latest peripheral madness, and a shining example of all that you can accomplish with the simplicity of 9.8m/s^2. I have it on good authority that in the future, battles will be fought not with bullets and bombs, but rather with laser tag and foam darts. After all, if what we’re trying to do is figure out who’s got the better fighting force, we can do that just fine and dandy without actually hurting people (except for, perhaps, the occasional dart in the eye, but that’s what protective goggles are for). Of course, all that means is that arms race will become about who has the best laser tag/foam dart weaponry. 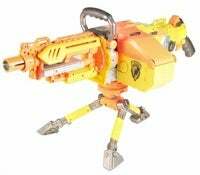 In that case, I think I’d put my money down on the Nerf N-Strike Vulcan EBF-25. This fully-automatic foam dart machine gun takes a belt of 25 darts that can be fired as fast as the battery-powered feeder can supply them. The included tripod keeps your aim steady while you’re keeping the enemy pinned down for your Nerf-wielding comrades to outflank. The $40 EBF-25 isn’t without its weaknesses, though. It requires 6 D-cell batteries to operate (not included), which can be a pretty heavy load. But it does get me one step closer to my goal of recreating the entire D-Day landing using only Nerf weaponry. It may be hard for you to remember, but all the way back in July of last year we told you about Nintendo’s new Wii Fit, the innovative balance board that you use for playing video games and realizing how out of shape you are. This morning, the Wall Street Journal is telling folks to get themselves ready (registration required) for the peripheral, which will finally ship in the US on May 19th (European Wii owners will get a shot at it a few weeks earlier, on April 25th). The Wii Fit board comes with a suite of balance-training games whose intent is two-fold: 1) to help you improve your own poise and dexterity and, more importantly, 2) to provide yet another in the long line of ridiculous activities that you and your friends can do at parties while pointing and laughing at one another. There doesn’t appear to be a price point on the Wii Fit yet, but we’d imagine that it won’t be too outrageous. Me, I’m waiting for the next version of Super Mario that requires you to use the balance board: Super Mario Balance or Princess Peach's Debutante School, or whatever. Once I realized that nobody precisely understood how gravity actually works, it started to bother me. But work it does, and that’s enough for the likes of Clay Moulton, who designed the concept Gravia lamp, a floor lamp that derives all of its power from the mysteries of gravity. The idea is simple: the Gravia is a large plastic column with a weight that you life to the top of the pole when you want to turn it on. It then drops slowly over the period of several hours, activating a rotor which in turn generates power for ten LEDs, providing the equivalent lighting of a 40-watt light bulb. All from the simple power of gravity. The most impressive part is the estimated lifetime of such a lamp: using it eight hours a day, 365 days a year, the mechanisms would last more than 200 years. In fact, the LED bulbs, which are usually pretty long lasting themselves, would be the short-lived components in this case. However, the Gravia’s still in concept phase, although patents are pending on the device. Perhaps it’ll even make it to market in the next few years. Imagine the reduction of energy use if we could generate power from freely and universally available gravity? Finally, I’d have my revenge for years of falling on my face. That’s it for this week. But even gravity can’t keep us down, so we’ll be back with more gizmos in just seven days. Stay tuned.